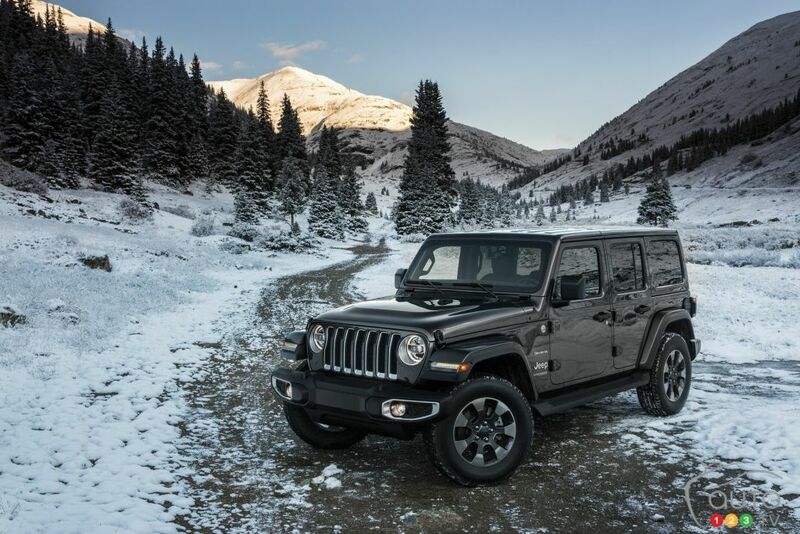 FCA pulled out all the stops when designing the next-generation 2018 Jeep Wrangler, which made its full public debut yesterday at the 2017 Los Angeles Auto Show and will arrive in Jeep showrooms in January. First on the list of goodies are two advanced 4x4 systems, and for the first time in Wrangler’s history, a Selec-Trac two-speed transfer case with full-time 4WD and a 2.72:1 low-range gear ratio that is available on Sahara models, allowing the driver to set it and forget it, while constantly sending power to the front and rear wheels. The Command-Trac 4x4 system features a two-speed transfer case with a 2.72:1 low-range gear ratio, and next-generation solid Dana front and rear axles with a 3.45 rear axle ratio. Meanwhile, on the Wrangler Rubicon, a Rock-Trac 4x4 system features heavy-duty next-generation Dana 44 front and rear axles with a “4LO” ratio of 4:1. A 4.10 front and rear axle ratio is standard as are Tru-Lok locking differentials. 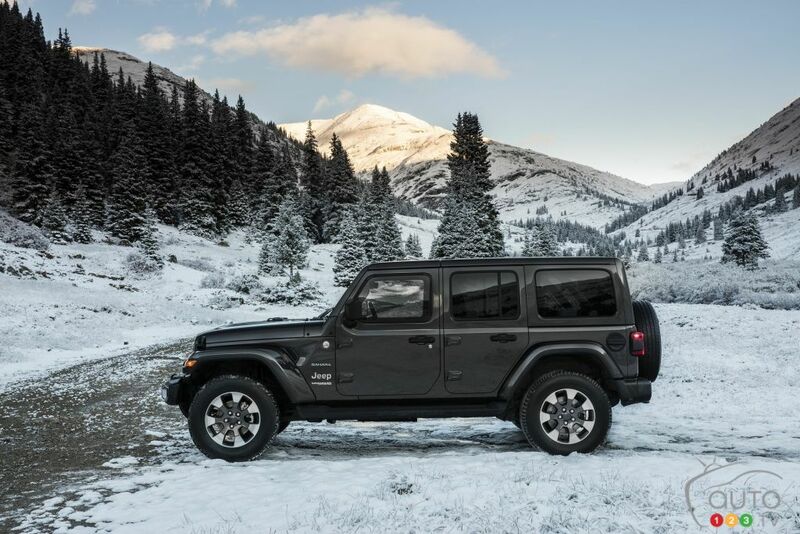 Lighter, yet more rigid, the 2018 Jeep Wrangler continues to utilize the proven five-link coil suspension configuration, but its shocks have been retuned for optimum balance between on-road handling and legendary off-road capability. Four skid plates and bars protect critical vehicle components while on the trail. Rubicon models benefit from heavy gauge tubular steel rock rails. A best-in-class approach angle of 44 degrees, breakover angle of 27.8 degrees, departure angle of 37 degrees and a ground clearance of 277 mm (10.9 inches) allows the Wrangler to go anywhere. It also benefits from up to 76 cm (30 inches) of water fording and up to 1,588 kg (3,500 lbs) towing capacity with the available towing package. FCA revised Canada’s best-selling engine, the 3.6L Pentastar V6 (285 hp, 260 lb-ft), to include Engine Stop-Start (ESS), and paired it with an all-new six-speed manual transmission as standard equipment or, optionally, a new eight-speed automatic transmission. 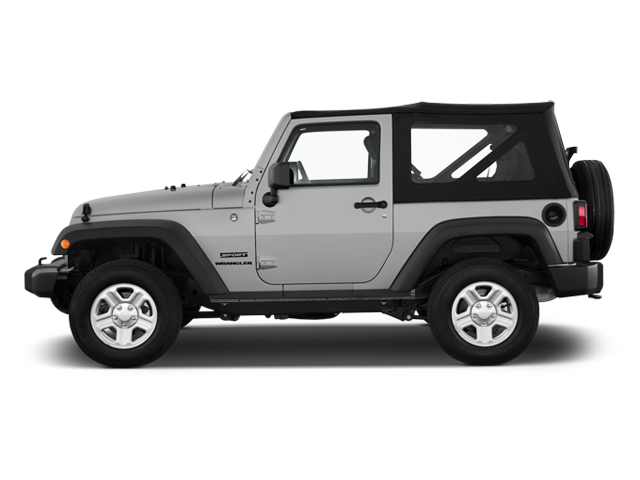 For 2018, the Jeep Wrangler also offers an all-new 2.0L turbocharged four-cylinder engine that produces 270 hp and 295 lb-ft of torque via that same eight-speed box. A new eTorque system improves fuel economy, launch performance, and driver comfort during start/stop operations. Its hybrid functions include auto stop/start, electric power assist, extend fuel shut-off, transmission shift management, intelligent battery charging and regenerative braking. But wait, there’s more: a 3.0L EcoDiesel V6 engine will be available on Wrangler 4-door models starting in 2019. This engine is rated at 260 hp and 442 lb-ft of torque and teams up with the aforementioned eight-speed automatic transmission, which is designed to handle the increased torque output. 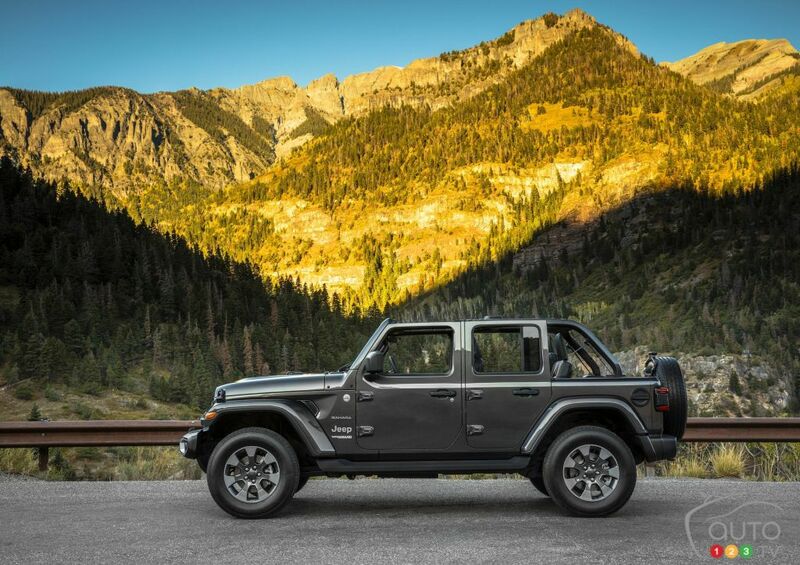 The 2018 Jeep Wrangler builds on a sculptural design aesthetic that is immediately recognizable with its traditional Jeep design cues. Take a look at the all-new front fascia, the lowered beltline with larger windows for better outward visibility, the updated seven-slot grille (where both of the outer grille slats intersect with the headlights in an homage to the Jeep CJ), and the new body-coloured sport bars that are welded to the body and feature integrated grab handles. On Sahara and Rubicon models, available LED headlamps and fog lamps offer crisp white lighting and add to the Wrangler’s distinctive look. These models feature daytime running lights that now form a halo around the outside perimeter of the headlights. They also share a body-colour hardtop option. Speaking of which, dozens of different door, top and windshield combinations allow for endless configuration possibilities. An all-new, easy-to-use Sky One-Touch powertop strengthens the Wrangler’s promise of utility and adventure by allowing occupants to retract the full-length open canvas roof with a push of a button (available in the second quarter of 2018). A new half-door design will be added in 2019. The 2018 Jeep Wrangler’s interior is way ahead of its predecessor in terms of refinement and technology, starting with a clean, sculpted centre stack that compliments the horizontal dashboard design and redesigned centre console, cloth or leather-contoured seats with accent stitching, metal-plated accents, and an engine start-stop button. The instrument cluster features a 3.5- or an available 7-inch TFT display, the latter allowing the driver to configure information in more than 100 ways. Meanwhile, the 2018 Jeep Wrangler offers a choice of three new Uconnect systems atop the centre stack. A 5-inch unit is standard, but only the larger 7- and 8.4-inch displays offer Apple CarPlay and Android Auto compatibility. 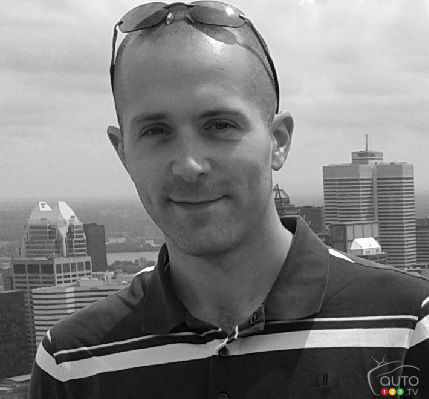 These systems include more easy-to-use features, enhanced processing power, faster startup times, and touchscreens that display high-resolution graphics. 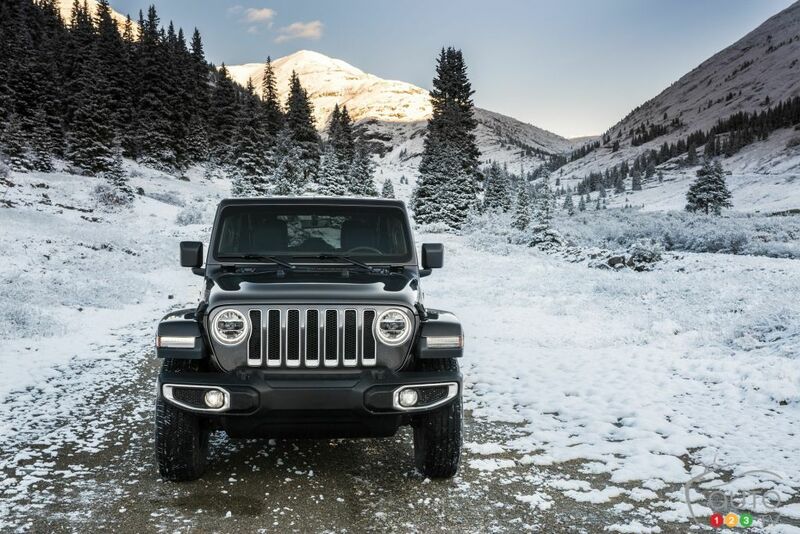 The 2018 Jeep Wrangler has undergone more than 6.2 million kilometres of testing, one of the highest totals ever for any FCA vehicle. Extreme-weather testing occurred in various environments, including the scorching Arizona heat and blistering cold of Alaska for months at a time. When it comes to production, FCA has invested $700 million USD to retool Toledo’s north plant for the all-new Wrangler and added 700 new jobs.